Meanwhile everything is hotting up (as it were) for the world's biggest Climate Action march, The Wave in London next Saturday. Coaches from all over the region are heading down to the city, and initatives from all over East Anglia are on board waving banners and wearing blue! On Saturday 21 as part of the build up to Copenhagen, Transition Norwich and Sustainable Bungay took part of a lively and colourful demonstration and rally in the central streets of Norwich. 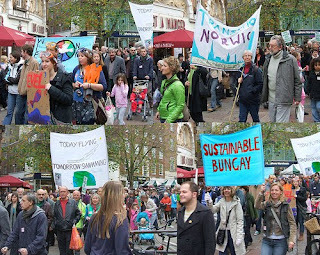 Christine Way, core member of TN reports: "On Saturday 21st November several transitioners gathered in Chapelfield Gardens to join the biggest ever Norwich Climate March while Tom (Harper) set up the TN stall on Millennium Plain ready for the Climate Emergency rally. There was a buzz in the air as the organisers and police negotiated the route which had already been agreed. At last the Samba Band with its drums and colourful dancers started and we were on the move, but not for long as the traffic ahead of us came to a standstill on St Stephen’s Street. This gave us lots more time to hand out leaflets and get the message across to the fascinated shoppers that climate change is real and we need to act now. The Transition Norwich banner was up there near the front and was clearly visible on the TV News bulletins that went out over the weekend. Then hundreds of people gathered outside the Forum for the Climate Emergency Rally where speakers including Dr Ian Gibson warned of the dangers of runaway climate change and of this being the “biggest issue of our time”. County Councillor Andrew Boswell said: "Gordon Brown should declare a National Climate Emergency and tell it like it is” and our very own Tully and Kate spoke about some of the solutions and all the positive things that are already happening in Transition Norwich and Bungay." Meanwhile Maria Price and Mark Crutchley from Transition Norwich (Buildings and Energy) and Kate Jackson of Sustainable Bungay were interviewed by the Politics Show (East). TN were filmed conducting a light audit in various city centre shops, whilst Kate was hard at work on her allotment! The report is scheduled to be broadcast on Sunday 6th December in a programme on Climate Change which will also include an interview with Professor Kevin Anderson, head of the Tyndall Centre at UEA.